The BioLite CampStove is a compact wood-burning cookstove that uses thermoelectric technology to convert heat into electricity. 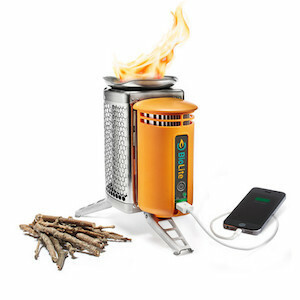 Relying on found biomass, such as twigs or pine cones, the CampStove provides an efficient fire, comparable to a traditional stove fueled with propane or white gas, while also allowing users to charge small electronic devices via a USB port. Fuel type: Renewable biomass (twigs, pinecones, wood pellets, etc.). Fire Power: Output Peak, 3.4 kW (LO), 5.5 kW (HI). USB Power Output: Max continuous: 2W at 5V, Peak: 4W at 5V. Boil Time: 4.5 minutes to boil 1 liter of water. Fuel Quantity: 1.6oz (46g) of wood to boil 1 Liter of water.